For this dish, the question begs. 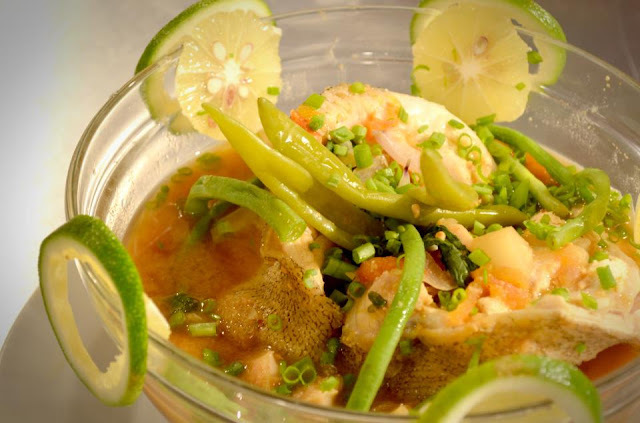 Why does Executive Chef Boy Logro call his next soup dish Sinigang sa Miso ni Magellan? Well, his irrepressible sense of humor shines through as he explains, it is because the fish uses for it is lapulapu. The tangy,zesty amalgamation of flavors explodes from the first sip to the last slurp and the juicy fish morsels going with it. 1. Place miso paste in a medium size pot with water, onion, tomato, radish, siling haba, gabi and cook until tender. 2. Season with salt, pepper, Lapu Lapu fillet then fill with kangkong (swamp cabbage), then roll and skewer with bamboo sticks. 3. Place on miso stocks, together with gabi (taro), radish and the roulade Lapu Lapu and cookuntil tender. 4. Arrange on soup plate and siding, garnish with sitaw, taro, swamp cabbage, radish and serve hot.